The DeWint House, or De Wint House, at Tappan, New York is one of the oldest surviving structures in Rockland County, New York and is an outstanding example of Hudson Valley Colonial Dutch architecture. 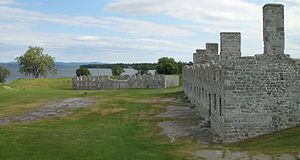 It was built using indigenous sandstone in 1700 by Daniel DeClark, a Hollander, who emigrated to America in 1676. The date is marked in glazed bricks along the façade. In 1746, West Indies planter Patriot Johannes DeWint bought the house. His daughter, Anna Maria, and her husband, Major Fredericus Blauvelt, lived at the house. 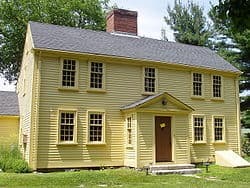 The DeWint House became a temporary headquarters of Commander-in-Chief George Washington during the American Revolution. General George Washington was a guest in the south parlor twice in 1780 and twice in 1783. The “Washington Room” at the DeWint House is a National Masonic Historic Site. 1780 (August 8-24) Washington stayed at the Dewint House while inspecting a redoubt on the Hudson. 1780 (September 28 to October 7) Washington returned for the trial, signing the execution warrant and subsequent hanging of British spy, Major John André, captured in Tarrytown, who was involved with Benedict Arnold in the plot to surrender West Point to the enemy. Major John André was held in the old ’76 House in Tappan, a tavern, which is now a restaurant. 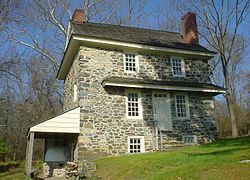 General George Washington provided meals from his table at the DeWint House to Major John André at the ’76 House. A stone on André Hill Road at Gallows Hill marks the site of André’s hanging. 1783 (May 4-8) – Washington and his key staff headquartered at the DeWint House while negotiating the final withdrawal of British troops from New York City with British General, Sir Guy Carleton, who twice served as Governor of the Province of Quebec, from 1768–1778. It was said to have been a friendly conference combined with an elegant dinner. Samuel Fraunces (owner of Fraunces Tavern in New York City) came up to prepare the dinner for Washington and his guest. 1783 (November 11-14) – a terrible snowstorm forced Washington to the DeWint house on his trip to visit West Point and later to New York City where he tendered his resignation. The property was acquired by the Grand Lodge of Free and Accepted Masons of the State of New York in 1932. The site was declared a National Historic Landmark and was added to the National Register of Historic Places in 1966. The site has undergone extensive restoration and upgrading. The house’s two first-floor rooms have been restored and furnished to reflect the period of Washington’s occupancy. A fully functioning replica kitchen, as General George Washington would have known it while he was a guest of the DeWints, was completed in 1996. An adjacent 19th-century carriage house contains displays of artifacts uncovered at the site during archaeological digs, as wells as items related to Washington, André and Arnold, and the Masons. A stone mill is displayed nearby and at the rear of house stand 7-initialed headstones which came from a nearby property. It is believed these headstones marked where the slaves of that home were buried. 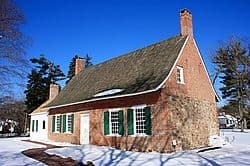 Today The DeWint House, (20 Livingston Avenue – Tappan, New York – 10983 – 845.359.1359), Carriage House and the surrounding grounds are open to the public without fee, 10AM – 4PM daily except for Thanksgiving and Christmas.